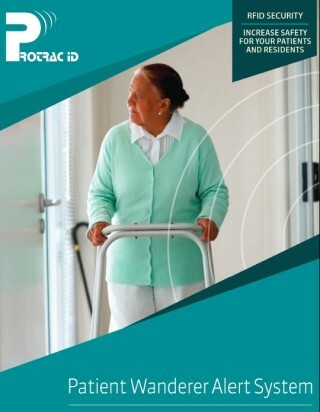 Protrac iD Patient Wandering Alert Systems detect wandering patients wearing Protrac iD RFID tags when they approach monitored doors or areas both inside and outside. Depending on the settings and the mode of operation selected the PWAS triggers alarms, locks or open doors, alerts staff and communicates with other systems such as Nurse Call, Access Control, Radio Paging, DECT Phones, Protrac iD AssetTrac or BabyGuard Software. Protrac iD Patient Wandering Alert System is available as a 2 part ie: 2R5000 PWAS Reader and 1RN350 Patch Antenna or the 2PA5000 ALL IN ONE. Protrac iD tags are individually identified and transmit a “heart beat” radio signal continuously with a battery life exceeding 3 years.